This is the most recent of my Viking series. It is said of many (if not all) artists that a work is a self portrait even though it doesn’t appear to physically resemble the artist himself. We are all the sum of our life experiences. In this instance it is not a self portrait of myself but that of who I would like to be, big, strong, fierce. I either drew on my imagination or used a football player. There is even a certain muscularity about the face and hair. 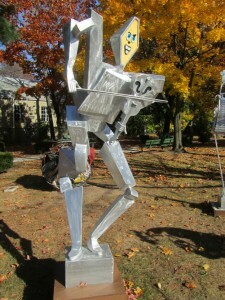 This is the latest of the musical sculptures and represent a transition. For many years I had incorporated musical instruments in my body of work. This limited my ability to show works outdoor since metal rusted and wood deteriorated. I then began to make aluminum instruments and if this was something of my own, I decided not to be limited by shapes based on tones but rather, my own imagination. Hence rather than one bell, my cornet has three and a different arrangement for pressing notes. Who knows, maybe one of my instruments might use three arms. That could be quite useful to a drummer. I don’t have to set limits. In it’s title is found a play on words. The conductor is electric in it’s conducting rather than in conduction of electricity. 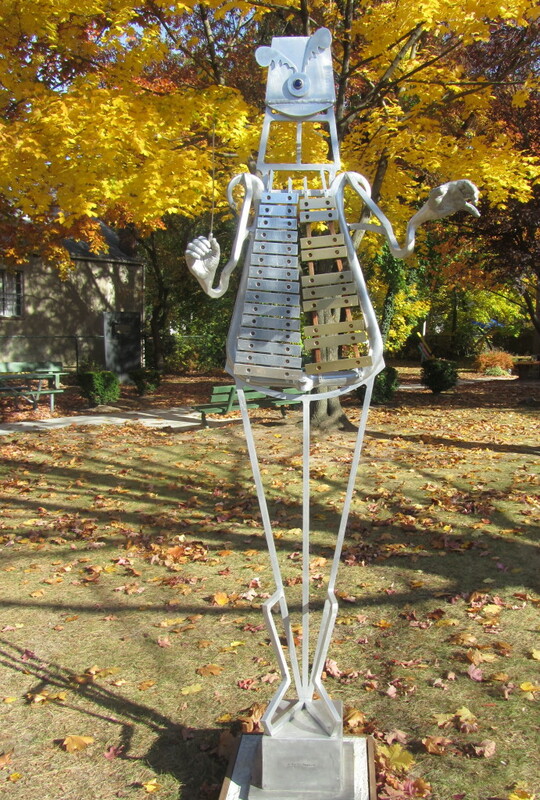 It’s body is a bell lyra, another double meaning with the body also serving as an orchestra instrument. 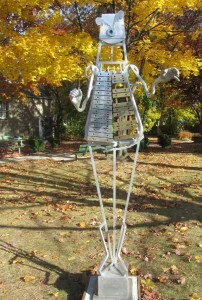 Originally created for my sculptural installation called “The Cocktail Party”, most of its works have been sold and the Electric Conductor now conducts a group of outdoor musicians. 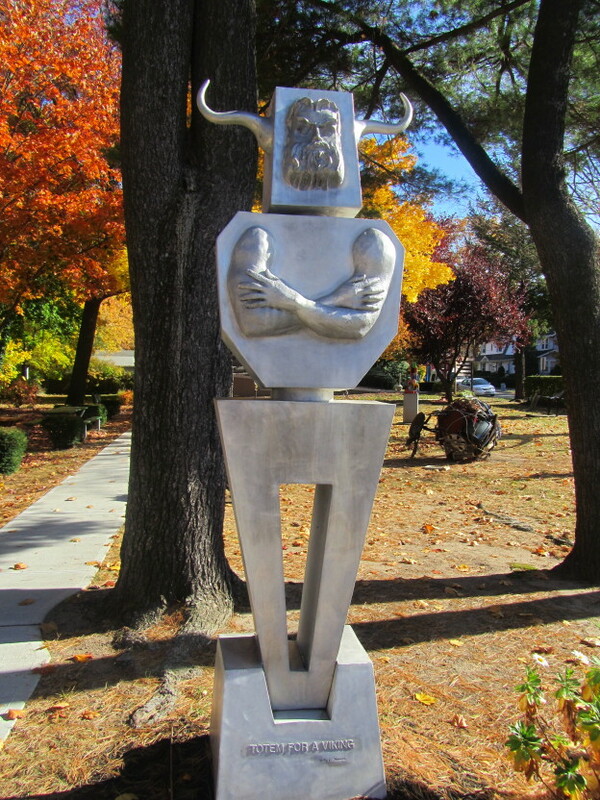 The figure is welded aluminum with cast aluminum hands and a real instrument. 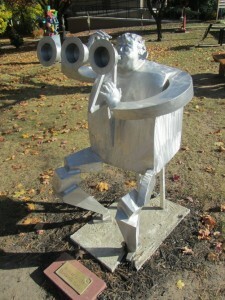 This is one of the outdoor musicians I have been naming over the past years. Violin, of wood cannot withstand the elements so I constructed my own violin of welded aluminum. The figure is made of welded aluminum with glass eyes. It’s movement is of dance and so the dancer creates its own music and then dances to it. Musical instruments have always struck me as beautiful. As a consequence I have incorporated them in my work for many years. The musical trio grouped together as shown in the Erica and David Boyd Sculpture garden. 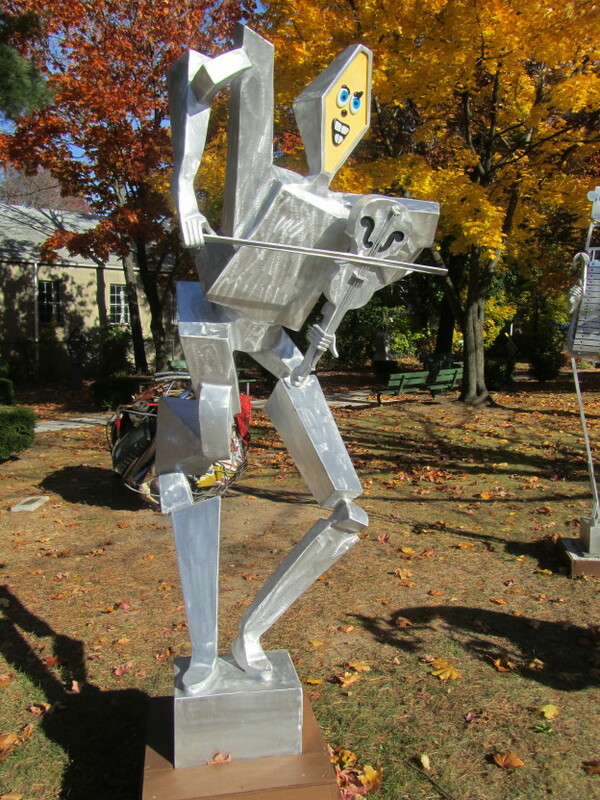 Tri-Cornet Player, Electric Conductor, and Dancing on a Box have been generously donated to the Borough of Leonia. 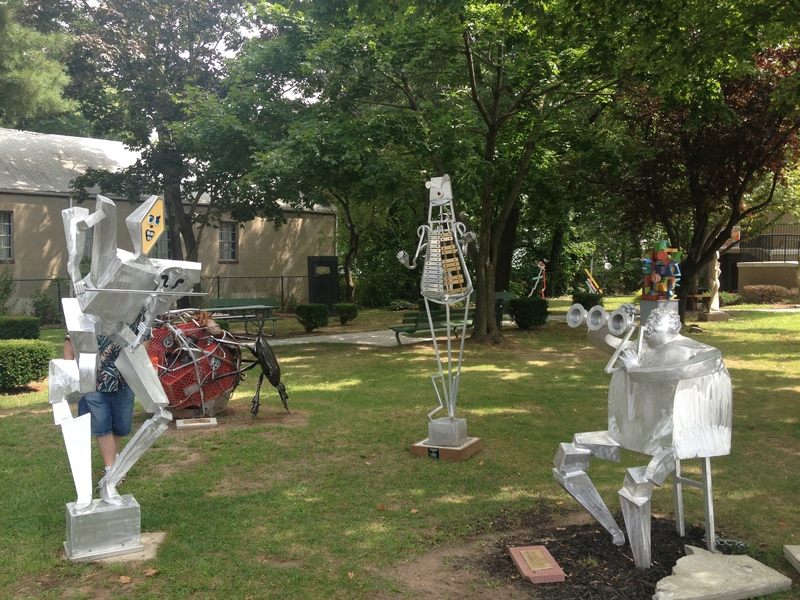 Previous post: ◀ Jackson, William D.
Taste of Leonia – 10th Anniversary!